Academic Building IV (AB4/ABIV) is a four-story classroom and office building at the corner of Avenue I and Bowers Boulevard. 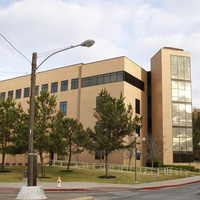 Opening in 2003, the $10-million, 61,070-square-foot structure was the first major classroom facility built since 1985. Its completion was planned for summer 2002 but lengthened due to unforeseen delays with weather and materials. The building houses the Testing Center on the first floor; the Career Service Office, Elliott T. Bowers Honors College and the James S. Olson Auditorium on the second floor; the Department of World Languages and Cultures and classrooms on the third floor; and the history and library science departments on the fourth floor. In September 2002, the 286-seat auditorium on the second floor was named for history professor James S. Olson in honor of his three decades of service to the university. The dedication ceremony took place the following February. Compliments to Professor Jaggers and her panel of guests. They provided great insight and much needed real life examples for success! Excellent presentation. Speaker was very engaging and knowledgeable. Material covered was very informative.